grassroots revolution, rather, it is one of vegetable and plant roots. can make a change, that they can help the world. Jesse is a recent graduate from the University of Maryland where he studied environmental politics and rhetoric. He has interned with AJWS, Uri L’Tzedek and Repair the World. 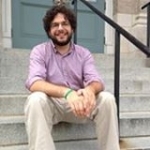 Jesse now works for AVODAH: The Jewish Service Corps. Jesse is active with Jews United for Justice, J Street, the Jewish environmental movement, and homeless advocacy. In his free time, Jesse can be found playing music, gardening, or cooking.